Apple this year will finally introduce video recording capabilities on at least one of its upcoming iPhone models, AppleInsider has been told. Details are few and far between, but the information comes from a person who's proven extremely reliable when predicting changes to the Cupertino-based company's hardware offerings. At this time, there's no information to suggest that video recording support will be available through anything other than a upgraded rear-facing camera that will, of course, also take still photos at a higher resolution. The addition, however, is reportedly just one of several hardware related tweaks that will surface in iPhone revisions due sometime between late spring and early fall. Another, that same person says, will be a significant boost to gaming hardware (likely via Imagination's new multi-core PowerVR chips). Video recording support has stood as one of the most glaring omissions from the iPhone since its inception two years ago, but the understanding is that Apple wants to get the feature "right." Possibly supporting these most recent claims is a screenshot from the beta of iPhone Software 3.0 published by Engadget earlier this week. 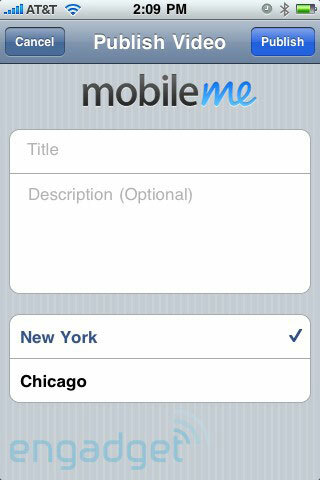 It shows a MobileMe panel for uploading images conspicuously titled "Publish Video." While the gadget publication speculates that this may be nothing more than an interesting typo, AppleInsider was informed of Apple's plans to include video support on the next-generation iPhone hardware shortly before Tuesday's introduction of the 3.0 software, and therefore believes the reference is significant and further evidence to this end. Word of Apple's mobile video plans arrives alongside claims that the upcoming iPhone revisions will support faster Internet speeds —a likely precursor to facilitating transmissions of video files over third-generation mobile networks. For its part, exclusive U.S. iPhone service provider AT&T confirmed during a communications conference last May that it had a HSPA (High Speed Packet Access) 3G network up and running in the labs at speeds of 7.2 megabits per second, or approximately twice the theoretical throughput of its existing network. At the same conference, the carrier's mobile chief Ralph de la Vega said AT&T planned to transition to HSPA release 7 sometime in 2009, which would deliver even faster speeds "exceeding 20 megabits per second." He said the upgrade would require few if any hardware modifications to the company's infrastructure and would instead be a smooth transition achieved largely through a software upgrade to its electronics. Should Apple's video plans for the next-gen iPhone remain intact, it's believed the capability would see support through a new "Movies" iPhone app that would provide rudimentary editing support akin to the audio trimming capabilities of the company's upcoming Voice Memos iPhone application. The same application would presumably allow users to email their movie clips to friends and family members, or send them via MMS messages. Though largely speculative at best, it's possible that Apple could market video recording capabilities as a premium feature available only through a high-end model. ArsTechnica on Thursday discovered references to four unknown multi-touch handheld products in resource files included with this week's iPhone Software 3.0 beta, including "iPhone 3,1." The reference joins discoveries earlier this year of an "iPhone 2,1" product in the resources of iPhone Software 2.0. Neither reference is tied to a shipping product, and both identifiers suggest iPhone models with distinguishing hardware features, meaning two distinct models could be in the cards. For example, the original iPhone identifies itself as iPhone 1,1, while the current iPhone 3G lists as iPhone 1,2, as the architectural changes between two models were relatively minor. As with similar practices for Macs, Apple's use of 2,1 and 3,1 imply major and distinct changes. For instance, the second-generation iPod touch is listed as iPod 2,1 and includes faster internal hardware than the first-generation model called iPod 1,1.